The Enterprise makes a brief detour from its mission to pay a brief visit to Omicron Theta, the planet where Data was discovered 23 years ago. There was once a thriving colony of scientists there, but now, there is nothing, not even bacteria in the soil. 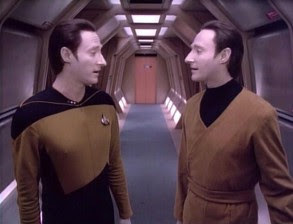 Attempting to unravel the mystery, they discover another android that looks just like Data. Though they look identical, this other android, Lore, is very different. He seems to have emotions that Data lacks. Does Lore know more than he is telling about the fate of the colonists? Was he somehow responsible? Kevin: The writing in this episode is not very good. There. I said it. Yes, it introduces an interesting character and adds a lot of backstory to Data that does get developed in interesting ways later on in the series, but right here and now, for the episode we have in front of us, there are some problems. Let's take them one at time. I'll say up front that the evil twin story actually doesn't bother me. It's a bit overused, but the unique opportunity Data provides for executing it is interesting in and of itself. Sadly, the actual execution was lacking. Matthew: For me, the challenge in this episode is trying to recapture my state of mind before I got sick of Brent Spiner and Data. Let me say, I like the character in principle, get what he represents, and appreciate Spiner's performance skills. But he became sorely overused by the last few seasons, and Generations really kind of killed it for me. Kevin: First, this is one of the more painful examples in the entire franchise of the crew being forced to act stupidly in order to progress the plot. They catch Lore trying to hide how advanced he is, and no one seems concerned. Well, that's not true, they are concerned about stupid things. Yar's question, and Picard's validation, about Data's loyalty was almost offensive. And somehow, they worry about Data's newly divided loyalty, but still do nothing to stop to the person Data might betray them for from having the run of the ship. Data catches him in another lie, and doesn't report it. When Dr. Crusher finds that "Data" has revealed something he asked her to keep confidential, she does nothing to further investigate this anomalous behavior until Wesley begs her to later on. This dovetails nicely with the other half of the stupid writing in the episode when it comes to Wesley. Aside from the quoteworthy "Shut up, Wesley," the entire plot device damages every character it touches. Picard made the kid a bridge officer, and it discredits his command authority that he would so crassly dismiss a concern of theirs. He's done and will do far more on a far less defined hunch of his crew. It doesn't help that Wesley petulantly declares this point to the entire bridge. Matthew: Yeah, even a ten year old can see the problems with the handling of Wesley here. Which raises the question of how in the hell no one on the writing staff did. I want to focus on the Data/Lore/Noonien Soong story a bit. Definitely a nice addition to canon, setting up many future interesting stories for Data. I liked the Asimov references, even if we never quite learn what makes a brain "positronic." One problem I had, though this is a franchise problem, not for this episode, is that Lore seems to already have an emotion chip, since he says that Soong "gave me the full richness of human needs and ambitions." Kevin: If you look up "contrived" in the dictionary, one of the definitions will be "inability to use contractions and facial tics." It has NEVER made sense that Data, who can learn other whole languages could not master English contractions. Plus...you know...he has used them before and will again. How and why was the tic there at all? It's a stupid way to try and differentiate them, and it makes no sense. If the tic was fixable, why not just fix it when they activated him? Also, Wesley really should pointed out at least witnessing the tic, as it bolsters his case and Lore's explanation was pretty transparent. Not even Data would emulate humanity by studying degenerative nerve conditions. Matthew: The twitch was irritating in its stupidity. If it is that easy to eliminate and transfer the twitch (with a sonic screwdriver), why not do it immediately, or years before this episode? Oh yes... because the plot needs some silly identifier for the slower audience members... And indeed, the contraction thing is stupid beyond belief. But even stupider is breaking your own rule, in the very episode you codify it in. At the finale of the episode, Picard asks how "Data" is, and he clearly says, both audibly and in subtitles, "I'm fine." Shoudln't this set the whole mistaken identity plot in motion again? 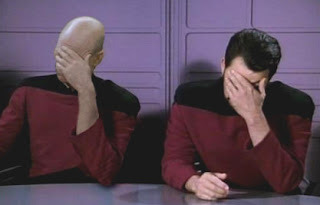 Only a double facepalm will do here. Kevin: The Crystalline Entity story was actually pretty good. It's a fairly novel solution to the "disappearing colonist" story, and the idea of such a creature is interesting and unsettling. I've always been a little unclear how Lore discovered the entity or how to communicate with it, but that's a relatively minor gripe. Evil genius and whatnot. Matthew: Although I enjoyed the crystalline entity story in theory, the execution was lacking. How were there children's drawings of it, displayed by "proud" parents, if it killed every living thing on the planet? Did it visit multiple times, like dinner courses? And inbetween courses, parents thought to themselves "hey, let's show our kids the monster which will eat them, and demand that they draw crayon pictures of it?" Lore communicating with it was not bothersome to me. What was bothersome was the Enterprise crew just beaming him out to float in space - shouldn't they know that he is essentially an evil supervillian who can survive in a vacuum? And how did they get him through the shields? Kevin: Acting is what really saves this episode, at least in terms of watchability. Brent Spiner is a gifted actor, it should shock no one to learn. He infuses Lore with just the right balance of bravado and ego and resentment. His threats to kill Wesley in the cargo bay were particularly disturbing to nine-year-old me. The only problem plotwise is that he is so convincing as a psychopath, you have to wonder why the crew didn't pick up on it sooner. His acting doesn't quite overcome the plot problems, but watching Spiner stretch himself was entertaining in itself. Matthew: Agreed. Despite my reservations for future-Spiner in the series, there is no faulting this performance. The performance itself is enough to differentiate the characters, which makes the writing contrivances all the more grating. Kevin: The rest of the crew turn in okay to not okay performances, but that is largely because of the stupid lines they are forced to say. Olivier and Branagh couldn't deliver some of those lines without looking bad. As always, though, Crusher's maternal concern is pitched perfectly. Matthew: Yeah, this is kind of a bloodbath for the other characters. They are all forced to act really dumb, and none of the actors manages to salvage it. Kevin: The set for Omicron Theta was okay, and the lab was pretty neat. The Crystalline Entity always looked pretty good in my opinion. It was obviously computer generated, and without needing to adjust for technological inflation, I still think it looks pretty good. Lastly, I thought the blue-screening to put two Data's in a scene was pretty well done overall. I don't recall thinking, "Wow..that is some obvious blue screen work." Matthew: I liked the Omicron Theta lab. It had lots of neat doodads, including the alternating double neon-light tube thingie we'll see about 400 times for the rest of the franchise. We get our first good look at the cargo bay and transporter, after a brief look in "Code of Honor." I agree that the splitscreen effects were pretty well done. They weren't bluescreen by the way, they were a simple optical compositing, two films plit down the middle and combined. You can see it just a tiny bit on the carpeting, but only if you're really looking hard for it. Some people are obsessed by details like this. Less successful was the body double work. I was never convinced it was even Spiner's back, let alone a 1/4 profile. The guy was skinnier and moved differently. Also, just a note on the music, the music cues were a little heavy handed in indicating Lore's villainy. Kevin: This gets a 2 from me. I want to like it more. Brent Spiner is such a good actor, and if the lines are bad, he delivers them with skill and gusto that ends up pretty engaging. But the bigger plot problems swallow this episode. Picard and company act out of character and out of logic to make the plot move forward. The way Picard treats Wesley and the way he responds to it make them both look bad, and if I were Wil Wheaton, I would forward all the Wesley hate mail to the writers as this episode was responsible for a fair share of it. Matthew: Definitely a 2, for a total of 4. Good concepts, one good performance, and future character possibilities save this from a 1. But The Stupid is strong with this one, and almost sunk it completely. Can someone explain to me the timeline of the omicron colony. I always thought the colony was destroyed by the Crystaline Entity and thats when Data was discovered. Did the powers that be then decide to recolonize the plantet only to have it attacked again and yet forget all records of the attack.? I always thought they found Data on the apparently abandoned Omicron Theta. The only wrench in that is that Geordi is surprised to see there is no life, not even soil bacteria, and that really would have been noted by the crew of the Trieste. 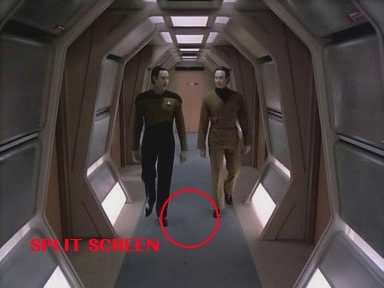 Also, why would Geordi's visor pick up a secret door, but not a tricorder? I also thought the entity attacked, the colonists fled to the lab, safe there until Lore communicated a way around its defenses. Right also don't you think they would have realized that no one had talked to the planet in 23 years!! It always seems like communication just stopped recently. 1. The split screen effects have been recomposited, making them much less obvious and much more realistic. 2. The new Crystalline Entity effects are quite faithful to the original, but with more detail and clarity. A very respectful job. Also, Kevin, it's the Tripoli, not the Trieste.